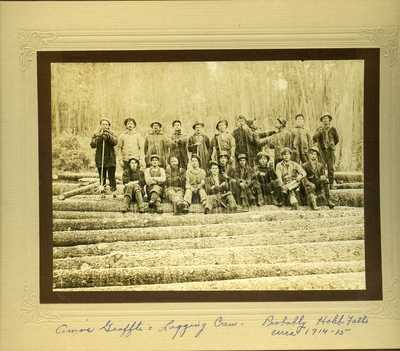 "Logging Crew, Probably Holeb Falls, Maine "
Black and white photograph of men in a logging crew sitting on logs. A handwritten note on the back of the photograph says, "Scaler at left. Note the kind of wheel he used for measuring." Labeled Amos Graffte's Logging Crew, porbably Holeb Falls, circa 1914-1915.